Man Behind Lens: Why Snow White, Not? I remember fondly those younger days when I was the Manager for "Focus", which was at 3, Penang Road; Penang. Focus was founded by the famous Penang lawyer, Lim Kean Siew. Apart from our roaring duty free sales, Focus also operate the largest colour developing and printing (D&P) lab in North Malaysia. 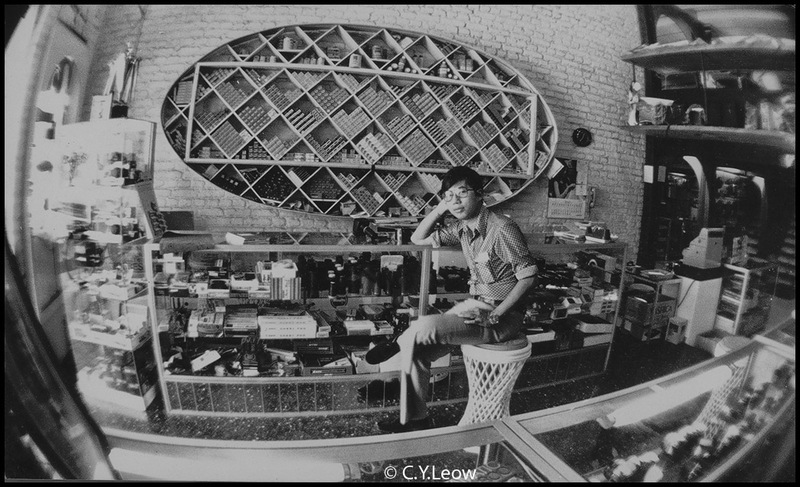 In the early 70s the lab monopolised nearly 80% of the colour prints business in Penang! A very large percentage of our customers were Aussies from the RAAF base in Butterworth. The shop was also a stone throw from E&O Hotel where we get plenty of urgent D&P work from the tourists. I learn from experience that every year during the winter months in the land far far away, a large number of our customers will be having their holiday in the winter wonder land. Without fail, every year; some of our returning customers will complain about their winter holiday colour prints! There was one customer who showed me five booklets of his snowy mountain shots and wanted to know "Why snow white, NOT?" What he meant was, why the snow at his holiday destination was pure white in colour, but his prints all show "muddy" and dull rendition of the white powder (snow)! Believe you me, it was tedious trying to explain why this happened! It was the early 1970 and Internet was TWENTY years away! Try explaining all that to an irate customer! So whenever I was faced with the same question, I assured our customers; next time, try OVER exposing their snow scene an extra f-stop, or two; by doing that the whiteness of the snow will improve! Some argued, what I said was illogical! "The snow scene was very bright and white washed, so logically; the camera will be over exposing it by at least one to two stops. To prevent that, I COMPENSATE by under exposing (-2) stops! Won't my deliberate over exposing make it worst?" 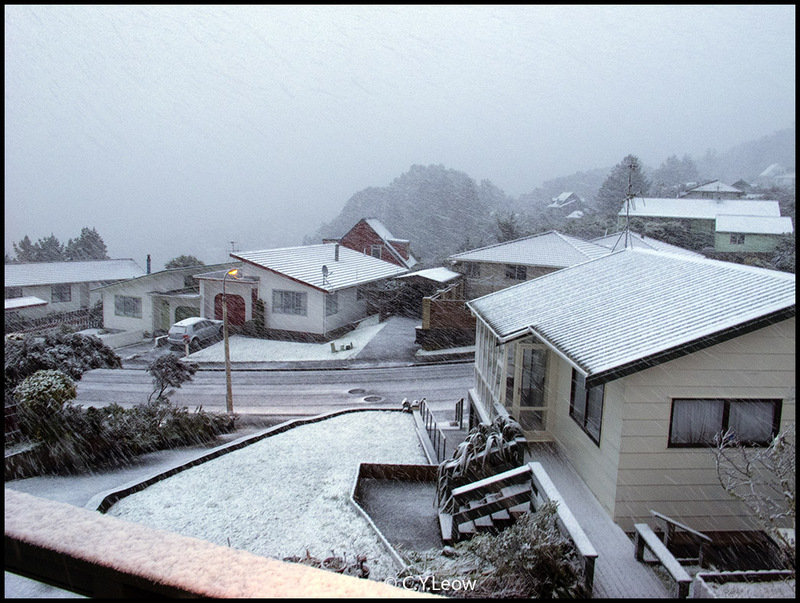 Take a look at these two shots I took outside our house, two days ago when we were snowed in. 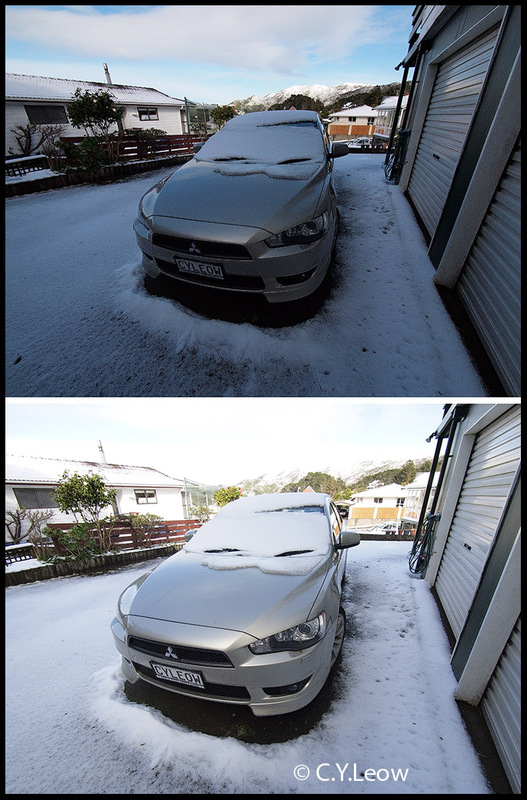 The top picture was shot with my E-P2 on "A", the light meter in the Olympus decided on the correct exposure by heavily UNDER exposing the scene, thus the snow lost it's brilliant whiteness. For the next shot, all I did was to set the exposure compensating to +2 and look at the result! The way how all exposure meters are designed, it will UNDER expose a scene with large area of light colour, like our snow scene. When exposing a scene with large area of dark colour or tone, the same meter will OVER expose your result! What about the white balance setting for snow scene? I always make sure my camera's white balance is set to AWB (auto white balance), I find this setting take care of the weird variation of white balance that my eyes cannot detect. The same blueish photo show it's true colour after the "auto color" treatment in Photoshop. The orange colour on the bottom left was caused by my deck's auto spot lamp. Yours truly at the front counter of Focus! Notice the different types of films (for sale) in the wall cubicles!